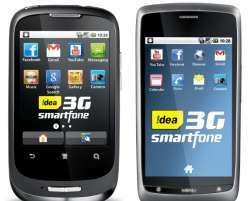 New Delhi: Extending its portfolio of 3G smartphones to 16, Idea Cellular has launched another device for Rs 4,999, which comes bundled with data benefits. The country's third largest operator has already sold over 7 lakh devices from its earlier range of 3G smartphones. "Idea is the only mobile operator in the country to offer a vast array of affordable 3G devices which is targeted at upgrading 2G users to 3G. With the launch the new device, Idea's portfolio of 3G smartphones has gone up to 16, and the company has already sold over 7 lakh devices from its earlier range," Idea Cellular said in a statement. The device, which will be available in 11 circles, comes with a special offer for existing 3G users offering 3G data benefits of 1.6 GB and free Idea TV for three months, with a pack priced at Rs 259. For new users, 1.6 GB 3G data and free Idea TV for three months will be offered with a pack of Rs 261. "Our strategy of proliferating data services through the sale of affordable 3G smartphones has worked well for us, and hence we will continue to build on our devices portfolio," Idea Cellular Chief Marketing Officer Sashi Shankar said.